The earliest information about the castle (castrum strolecense) dates back to 1303. Probably the prince's stronghold was situated at the place of the ruins of the castle. It is hard to find out now whether it was built by strengthening an old, wooden construction (the former hunter's shelter) or by a new construction. The settlement with a hunter's castle was the place inhabited by hunting princes of Opole. The town acquired defence structures in the year 1323, during the reign of Prince Albert (son of Bolesław I). It was confirmed that Prince Albert resided in Strzelce because all documents issued by him in the first half of the 14th century are dated in the Strzelce Castle, for example, a document from 20.09.1342 refers to Prince Albert as the "lord of Strzelce" (nos Albertus dei gratia dux Junior Opoliensis et dominus Strelicensis). The Prince used to organise the so called court days when all knights and citizens were invited to the castle. The Prince always chaired the meetings. He often showed mercy, gave away possessions or privileges to knights or clergy. He authorised purchase and sale of lands and was a judge of disputes. All documents were drawn by a court notary or chaplain. Depending on the epoch, documents were written in Polish, Czech or German. They were always certified by an attached wax seal of the Price. The castle was ruined during the times of margrave Jerzy of Brandenburg, from Hohenzollen line. Register of landed property from 1534 emphasises its bad condition. The so called Great Farm, owned by the castle, possessed 40 cows, 20 oxen and 300 sheep plus 4 mills within the town. In that time, the castle income was estimated at 27.000 thalers. Jerzy von Redern (owner of the castle) gave guild charter to the Strzelce potters in 1575. They were obliged to provide several pots to the castle kitchen each week. In return, they were allowed to dig clay in the castle's lands. It is also significant that craftsman candidates were obliged to built a stove in the castle. During the reign of Count Andrzej Maria Renard, around 1848, there was an alcohol distillery in the castle. 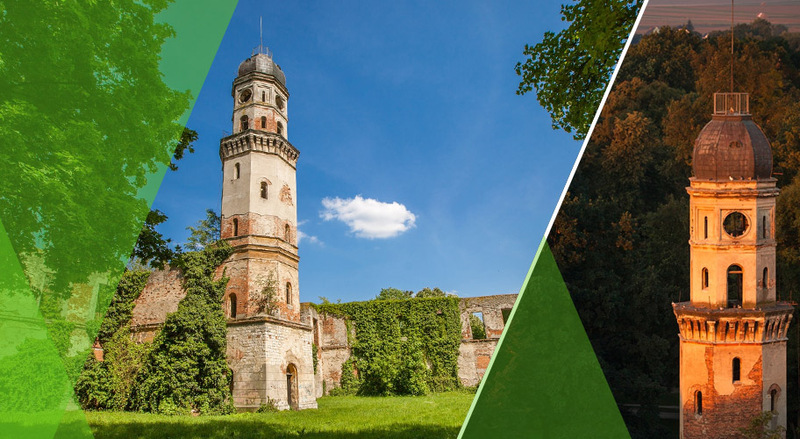 During that period, count Renard realised considerable investments in the surrounding area, a castle tower and some extension was built in the middle of the 19th century, from the side of the road toward Kędzierzyn - Koźle (the so called farm hands' living quarters). Total rebuilding made the former style of the castle disappear. The last owner - between the wars - was the dynasty of Castell-Castell counts. The castle did not change much in that period. The Soviet troops destroyed the town and castle in the end of January 1945. The castle was made of stone and brick, with plaster, before destruction. As in the past, it had 2 wings - east and west. East wing is now partly collapsed. The entrance gate dates back to the second half of the 19th century, in late classicistic style. In the gate's sides there are niches with stone statues of St. Jan Nepomucen - patron of accidents on bridges and St. Florian patron of fires (and firemen) dating back to the 18th century, in late baroque style. Only ruins are left from the past glory of the castle.